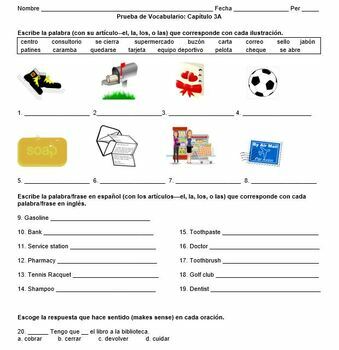 -First section has illustrations for 8 of the terms with spaces below for kids to write the Spanish words with their articles. 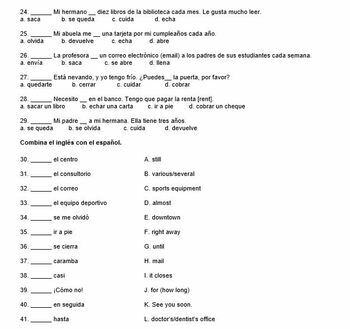 -Second section has what I think are the 11 easiest terms (including cognates like "banco" and ones that are too easy for matching, like "estación de servicio" and "pasta dental") in English with spaces for students to write the Spanish. 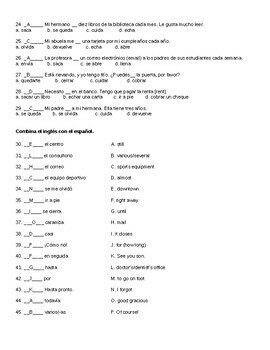 -Third section is multiple choice (10 terms) in which students have to choose the verb that makes sense in context. For example: El supermercado __ a las 5 de la mañana. -Fourth section has matching (14 terms) for the rest of the terms. They're the more difficult ones like "consultorio," "en seguida," and "Como no." 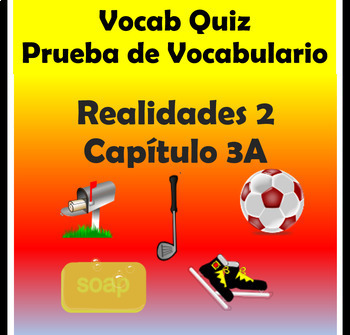 You could use this as a real quiz or for vocab practice. It does have a key included.